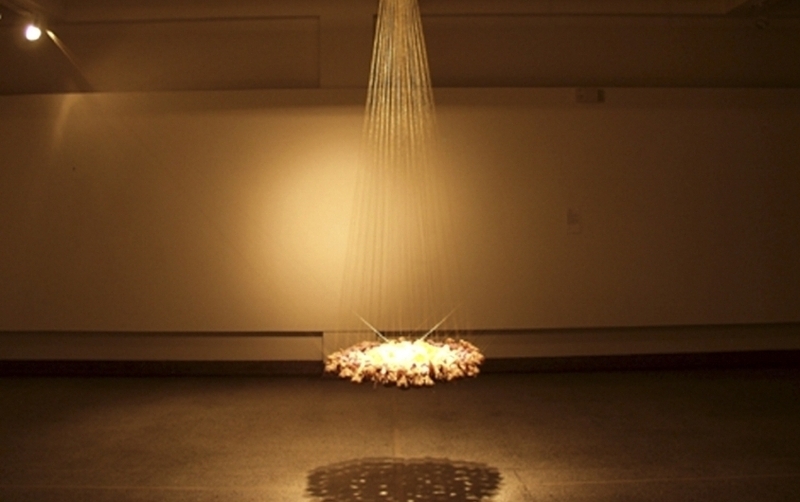 Twinkle Twinkle (2015) arises from the Flying Rug of Drone Mobiles (2009-) and consists of floating blade planes and folded US$ banknotes stars. Made from the altered children’s mobile toys and a reference to Alexander Calder’s iconic mobile works, Twinkle Twinkle lingers between a child’s wonderment and innocent rhyming of twinkling stars and the horror and macabre reality of today’s ongoing war and terror. The blade planes - a reference to the utility knife used to hijack - further transpires to bring attention to the menace of Drone planes or unmanned combat aerial vehicle (UCAV) and carpet bombing that has robed many cradles and killed many innocent civilian victims in countries like Pakistan and Yemen. Furthermore, once used mostly for sensitive and specialized military operations, drone planes are now a common sight on the shelves of children toy sections and are used in civil and recreational applications such as policing and surveillance, aerial filming, and drone games. The work argues that a weapon, weather a gun or a drone, once become part of the everyday life and placed in children’s hands as toys has the potential to desensitize kids to violence. It is thus not only important to find a responsible stance and international law to curtail the use of Drone plane but also to limit the exposure of such weapons, especially in younger kids. The Chain of Blasphemy, 2013, Hand-assembled multicoloured-rubber band chain and dressmaker pins, Dimensions variable. 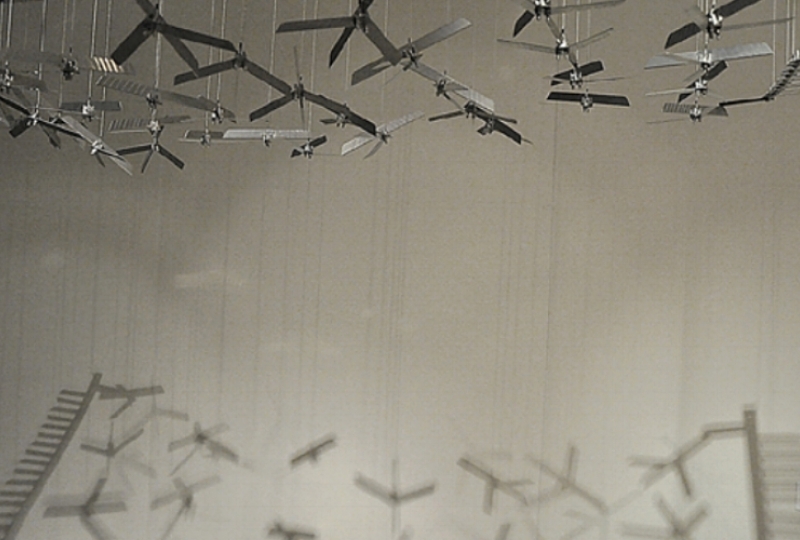 Syed’s work takes the form of an oval-shaped mobile made from box-cutter blades crafted into minimalist drones. 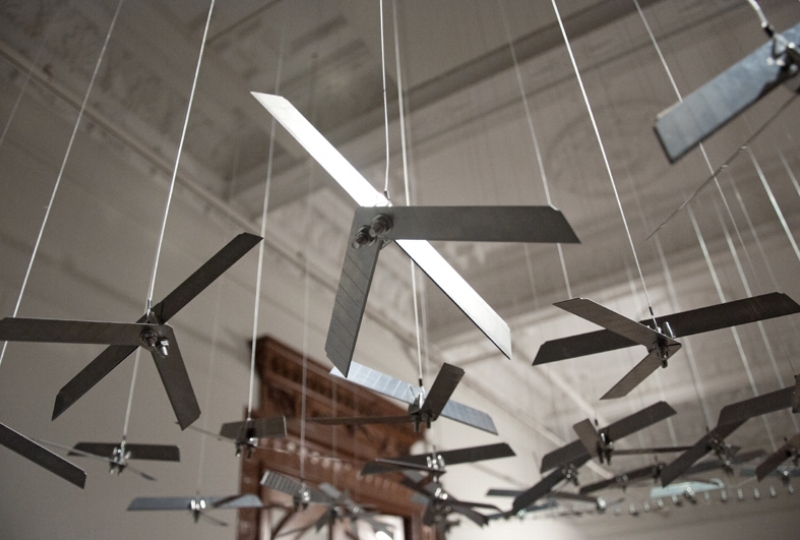 Referencing the weapons that were used by the hijackers of the 2001 Twin Tower attacks in New York, while assuming the form of military technology used in retaliation by the United States, the material and shape of the work creates a dialogue of the recent conflict between the Middle East and the West. A perfect rendition of juxtaposed motifs, The Flying Rug of Drones hung precariously close above viewers—as a testament of regional conflict fuelled by fear and violence—and invited those who dared to walk under its looming shadows. A minimalist angular hexagonal grid pattern is projected as the shadow of a circular rug. 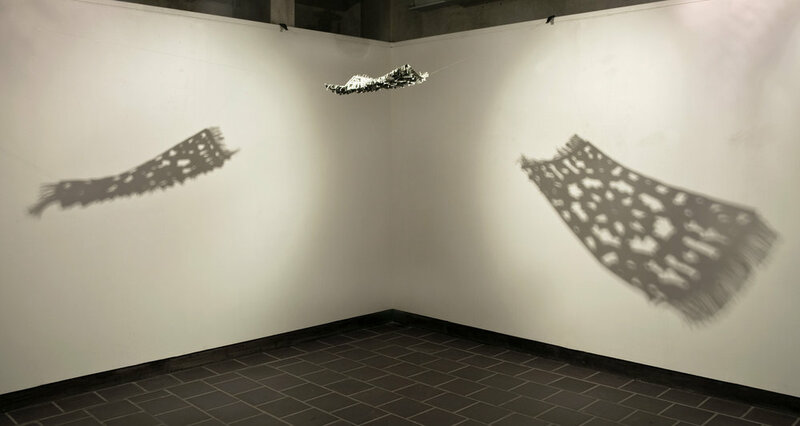 Box cutter knife blades attached together in the shape of drones hang overhead to cast this shadow. Viewers are invited with a dare, to walk under the blades, to hold a filtered fear, to experience a simulated anxiety. “The Flying Rug of Drones” by Sydney based artist Abdullah M. I. Syed captures the fascination and fear of the East, referencing both the magical rug form Arabian Nights as well as the carpet bombings with drones that have become a hallmark of American intervention. Originally from Karachi, Pakistan Abdullah [is] witnessing Pakistan’s mercurial bearings from afar. [His] response, like those of so many artists from the diaspora, can’t escape the ripples the politics of their homeland creates. In using the symbol of the flying rug, Abdullah references the myths and legends created around covering distances instantly, while acknowledging that the drone has perhaps surpassed this fantasy, in being operated remotely. Flagging (2005) is a tapestry installation of seven strips of fabric derived from the flag colours of India, Pakistan and Bangladesh. 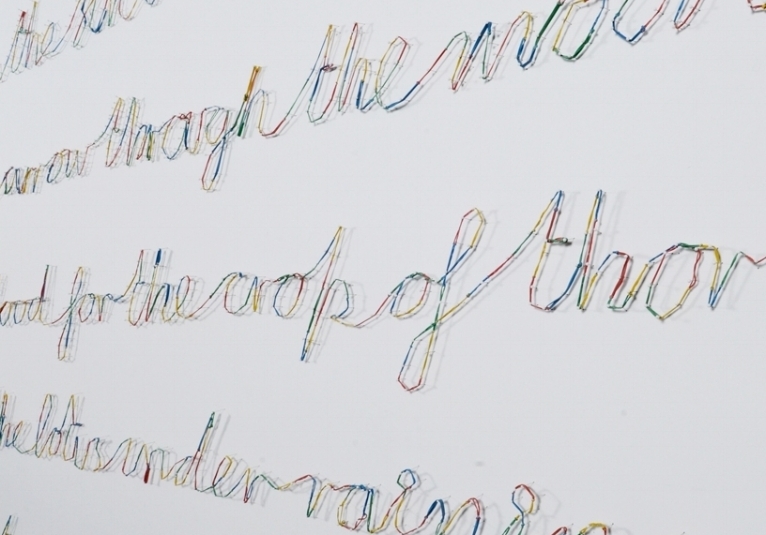 The premise of this work is to create a spectrum of colours to argue about the collective vs individual identity and how borders, partition, divisions, lines define and construct such identities geographically, psychologically and emotionally. The strips/lines of the tapestry are geometric and linear, representing clean and non-bending identities. But once put on; the strips transform themselves into an organic, undulating and overlapped surface, and within these flagging strips, a less defined and ambiguous identity is taking refuge that is neither individual not collective. Such didactic meanings are the essence of this work.